The engagement puts the focus on a growing area of collaboration between the two sides. 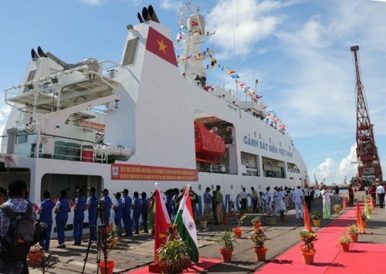 This week, an Indian coast guard vessel paid a port visit to the Vietnamese city of Danang. While this is just one of a series of scheduled defense engagements by the two sides expected this year, it has nonetheless once again put the spotlight on the growing security ties between both countries. As I have noted before in these pages, Vietnam and India have looked to advance their existing defense relationship as part of their wider ties, which were elevated to a comprehensive strategic partnership in 2016. Defense ties have grown in recent years to include not just the traditional components in this realm of ties like exchanges and port calls but also the training of personnel, capacity-building funding and equipment, and coast guard collaboration. That trend has continued over the past year as well. Indeed, in just the past few months alone, we have seen a number of significant developments in the maritime domain, including the first visit by a Vietnamese coast guard vessel to India. This week, the maritime aspect of ties was in the headlines again with the visit of an Indian patrol vessel to Vietnam. The Indian Coast Guard patrol vessel ICGS Vijit, headed by Captain T. Ashish, docked at Tien Sa port for a four-day visit to the Central city of Da Nang from April 1 to April 4, in what was characterized as an effort to strengthen both the overall comprehensive strategic partnership between the two sides and the two coast guards in particular. The trip included a range of engagements. Following the arrival of the ship, which had abut 140 crew members on board, there were a series of welcome events that featured representatives of the Vietnam Coast Guard Command, Coast Guard Region 2 Command, Military Region 5 Command, Da Nang city’s Military and Border Guard Commands, Da Nang city’s Department of External Affairs, and Indian Embassy in Vietnam. The Indian coast guard officers and crewmen also paid courtesy visits to the Military Region 5 Command, Da Nang People’s Committee, joined a table-top exercise, and participated in a table-top exercise as well as friendly sport matches at the headquarters of the Coast Guard Region 2 Command. The Vietnamese and Indian Coast Guard forces also took part in a search and rescue drill at sea. Unsurprisingly, few additional details were publicly disclosed by both sides about the specific aspects of the engagement. And, to be sure, the focus on a single interaction should not conceal the real challenges and constraints that remain, that officials and personnel from both sides are cognizant of. Nonetheless, as the two countries continue to advance their relations in the defense realm, notable developments like this one will be important to watch. What’s Next for the India-Vietnam Comprehensive Strategic Partnership? President Ram Nath Kovind's visit to Vietnam highlighted the broader trends underway in the bilateral relationship.